Your choice of 4 tabletop colours to complete your event styling & finish. Stunning variety of square poseur tables for hire available to hire today! Benefit from top quality Oro poseur tables in the quantity you need. Great choice of clear glass & black glass poseur tables that look stunning! Square based & square post poseur tables provide a modern look & finish. Our range of different style poseur tables completes your choice options. 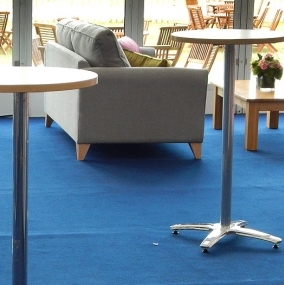 Poseur height folding cocktail tables, perfect for large scale event catering. A classic accessory for any bar area are poseur tables that are the elbow height tables you would find in a nightclub or smart bar or pub. Stand at these tables or sit on adjustable height bar stools to give you bar area a quality and stylish look and finish. 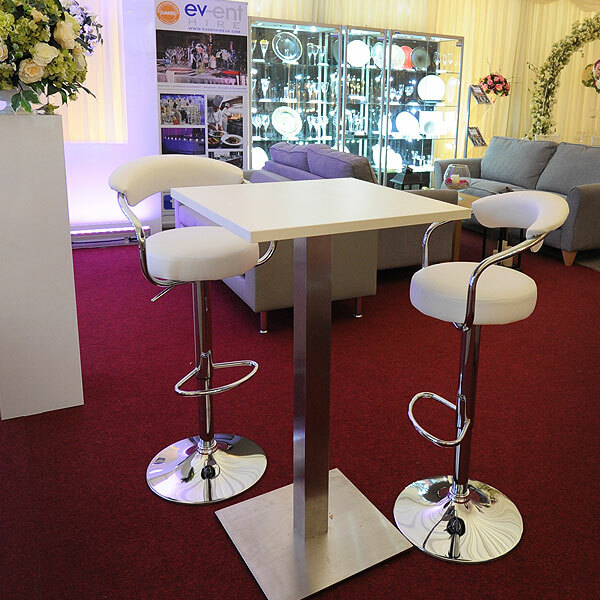 Event Hire UK has an extensive range of poseur bar tables for hire so take a moment to browse our range - we guarantee that you won't be disappointed. In this section you will find round and square Jem poseur bar tables for hire, round oro poseur tables for hire along with the option to hire ammon poseur tables and bar poseur tables for your UK event. Hire Poseur Bar Tables For Any Event...With Or Without A Bar! It’s easy to think that when you hire poseur tables, you are hiring them to go alongside a bar at a wedding reception or for an after-show party at a fashion show event or similar occasion. Whilst this is indeed the case – and they do look great with a bar – this is not the only time when hiring bar poseur tables are suitable. They can also be used at events such as exhibitions and trade shows for example. 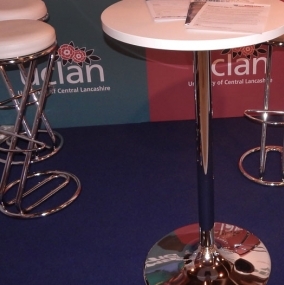 Many organisations at trade shows have booths which can be relatively tight on space and so you need to think hard about what furniture you are going to put in there to maximise the effectiveness of the area whilst also making it inviting and welcoming for your guests such as clients and new business prospects. 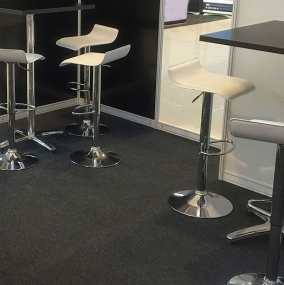 By hiring bar stools and poseur tables, this alleviates the need for larger sofas, armchairs and other type furniture which will take up more space, whilst still providing a professional look for your stand. Poseur tables for exhibitions allow you to have face-to-face meetings with clients on both an informal and formal level – you choose. It's Not A Case Of One Poseur Table Style Fits All! 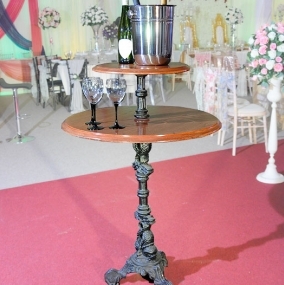 Being as Event Hire UK is a national event hire specialist, as you might expect, we don’t simply hire just one style of bar poseur table, we offer many different designs from which you benefit by choosing the most appropriate design for your event. 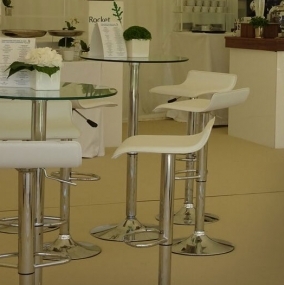 It’s the range of poser tables that makes Event Hire UK stand out from the crowd, enabling you to choose the best fit of poseur table for your upcoming event or special occasion. 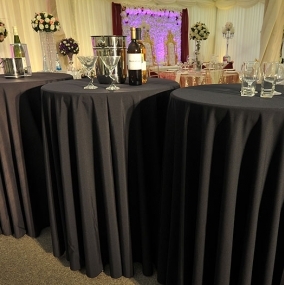 We also have the availability for you, by having extensive inventories of poseur bar tables for hire across our three sales and distribution centres in London, the Midlands, the North West and the North, enabling us to meet your requirements whether you need to hire a hundred bar poseur tables for an arena Christmas party event or a couple of poser bar tables for use at a trade show. Whatever your event and whatever your requirements, give us a call! Allow us to work with you to provide all your bar requirements and anything else you need to complete your event. We provide a one-stop-shop for all your event needs, whether it be bar furniture, catering equipment, china, cutlery or glass hire. We are here to make your life simpler, so why not get in contact today!